With these words the Gospel of St. Matthew’s comes to an end. We began this Gospel with the proclamation of the birth of “Emmanuel” – God with us; and we end with these words from the risen Jesus which conclude the great commission. Jesus says – remember (make present in your life) that I am with you always! What an amazing promise. In the Judaism of Jesus’ time access to God was limited to the temple and to gain access to God’s presence one had to come to the temple and offer a sacrifice and offering. But in Jesus - because of the crucifixion and resurrection, this access is opened up. The risen Jesus is with us now and always and because of this God’s presence is always available. What an amazing gift. But one that we need to remind ourselves of on a regular basis, for I think it is too easy for us to take this gift for granted. Out of this concern come the Sacraments of the church. The word Sacramentum is a Latin term used to designate an object which represented the presence of the Emperor with the Legions of Roman soldiers. It was a pole with an eagle on top and with colored streamers attached. This “sacrament” indicated to the troops that the Emperor was with them in battle. If this object fell then this meant that they had been abandoned. Later the church took over the word Sacrament and redefined it to indicate something through which people could experience God’s presence in a central and profound way. The Mediaeval church designated 7 Sacraments. Martin Luther pared those down to two: Baptism and Holy Communion. For Luther a formal Sacrament needed two things: a physical element and the Word of God. These two things in combination came together to provide a formal experience of God’s presence. So in Baptism – water + God’s Word (see Matthew 28:19) – God brings us into community, we take on the name and story of Christ as we are symbolically drowned and raised again (Romans 6:4). In Holy Communion we celebrate God’s presence and receive the assurance of the forgiveness of our sins and are spiritually strengthened and nourished through our taking the bread & wine: bread & wine + God’s Word (I Corinthians 11:23-26 - and all 4 Gospels!). 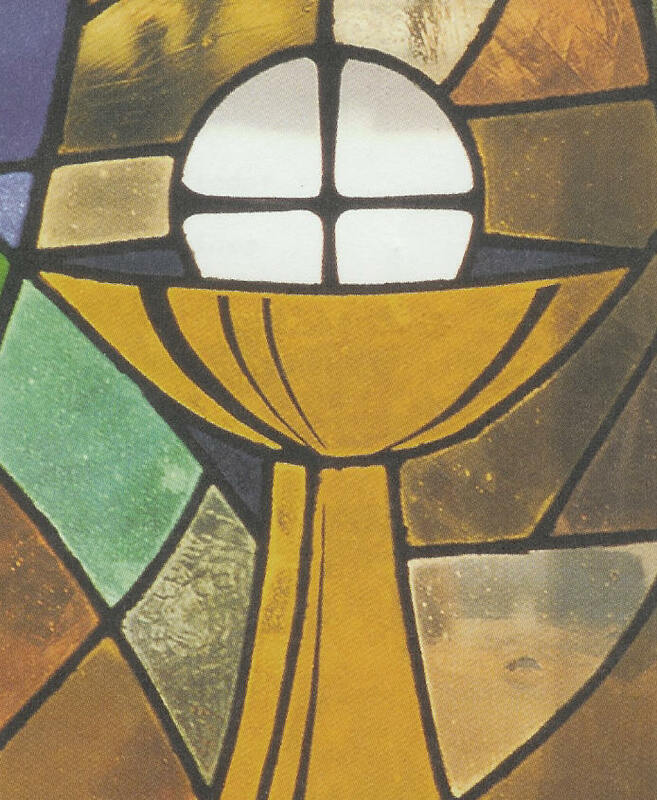 Baptism and Holy Communion are the two foundational Sacraments of our life in Christ. We need to regularly remind ourselves of our Baptism and weekly receive the Spiritual nourishment of Holy Communion. Luther suggested that every time we encounter water it should remind us of our Baptism and that we should dip our hands into water in the morning upon rising and in the evening before going to bed, make the sign of the cross and give thanks that through our Baptism we are a part of God’s family. This is why we leave the Font out after a Baptism so that you can dip your hands in the water, make the sign of the cross and remember your Baptism. Occasionally, on certain Sundays (like All Saints and the Baptism of Jesus and others) we will use the longer Affirmation of Baptism which includes a sprinkling of water. This is all to help us deepen our faith by remembering – getting us in touch with the moment when we were adopted into the family of God and when we took on the name of Christ: Our Baptism. The bread and wine of Holy Communion are "For You!" And the celebration of Holy Communion is both an essential part of our worship and of our lives as Christian disciples. Through the regular reception of Holy Communion we are spiritually strengthened and nourished for service in Christ’s name; we are sent forth to bear the presence of Christ to those whom we encounter – in other words – we are sent forth to be a Sacramental presence of Christ in the midst of the world. This is why the regular celebration of Holy Communion is essential and why we at Peace celebrate it every week. Admission to the table is open, as it should be, because it is the Lord's Table - not the pastor's or Peace's or the ELCA's - it is the Lord's. All who have been Baptized are welcomed to the table and this includes children. There is a tradition in our church to have children go through First Communion instruction when they are in the 3rd/4th grade. It is important to note that this is not a condition or a prerequisite - it is an opportunity to help the children deepen their respect for the Sacrament before they commune for the first time. God's Grace is operative and central here as it is in Baptism. Just as there is no condition that children understand and affirm their faith before they are Baptized, there is no condition of understanding before admission to Holy Communion. It is the Spirit which gives understanding in both cases - our calling is to offer the gifts of God in Water, Bread and Wine. And so, Baptism and Holy Communion are the foundational Sacraments of our Christian discipleship. But what about those other 5 Medieaval Sacraments and what does it mean that we are a “Sacramental presence” in the midst of the world? We will continue next month to look at these and other questions.